Experience The “WOW” Disconnected Haircuts! 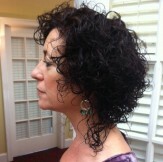 What a “GREAT” experience to work with Terry Lynns curly locks, she is happy to have such a trendy and youthful haircut! More Minx…. Girls!!!! Callie picked out “Lisa Logans Desert Rainbow” and she was so crazy about them!!!! The yellow and purple colors were just right for her. Callie can’t wait for school to start so she can show off her next Minx….So Girls take a look at Minxnails.com you want believe all the new designs!! Have Fun and Hope to see you soon!!! Minxed for the New Year!!! OK! Look at this!! This is hot for the New Year!! What an exciting color to wear! Wow!! Pat did so well on Saby’s nails and they have lasted for more than two weeks, unimaginable!! That style, high fashion, and koolness is greatness!! Look at the color as well as the shine. Two weeks later it looks the same with a few edgy tips! And if you file them with a fine grit file like 200 or so grit you’d be good to go for another week. The new growth at the base of the nail is the tell. If you are a slowgrower they last longer! Three weeks is about the limit, you know! I like two weeks, but sometimes that doesn’t happen, so it may take three weeks to get new ones and only the new growth looks bad, but everyone is looking at the rest of my nails to notice what I notice. The new growth!!! Her next step for her nails is the Shellac system. She choose Red Baroness from Shellac for her next color. Hello Shellac Nails!! Can you believe it? I can, ’cause I’ve been wearing it for the last 4 weeks! Shellac goes on like polish, zero drying time, lasts 2 weeks, and is easily removed in minutes. My first and most favorite color is Fedora! I’m currently wearing Hot Chilis and its now day 9 and it looks awesome. Shellac doesn’t chip, scratch and the high gloss shine really lasts for the full 2 weeks. Next week I’m back to Fedora! We are close to many of the surrounding cities beyond Dallas like Plano, Addison and Frisco so we are easy to find! One of my clients had hers on for 18 days, her nails grow slowly so the cuticle was not a problem, whew! So say Bye Bye to an Old Fashion Manicure and Hello Shellac! Hot, fashionable Minx Nails! These are one of my favorites! They are high fashion and addictive! Sabrina wore these for 2 1/2 weeks and was very happy with the wear and all the compliments! Many of my clients can’t wait to see what I’m wearing next on my toes! Today it is Illusion Snake Skin, in several weeks I’m choosing Snow Cheetah like I did for my client Karen this weekend! Karen took her previous set of Minx nails to Mexico and played on the beach and they looked unbelievably good afterward, you know how nail polish and beach don’t mix! Minx nails last and last, usually 4 weeks on the toes, 2 weeks on the fingers and sooooo many designs to choose from! It is exciting to have such high fashion for my clients nails! Global Keratin/Better than Brazilian Blowout? Yes! Global Keratin is the first and only company to harness the beauty benefits of Juvexin. Derived from sheep wool through an environmentally-friendly process, Juvexin is delivered to the hair in its natural state. This Hair Treatment restores hair by repairing and providing long-term conditioning and protection. Unlike hydrolyzed keratin, the critical amino acids in Juvexin remain intact, restoring and maintaining the hair’s youthful vitality. The long protein chains of Juvexin closely mirror the hair’s own keratin structure. Unlike Brazilian Blowout, Global Keratin Hair Treatment lasts up to 5 Months. Juvexin is Global Keratin’s foundation in creating manageable, smooth, shiny, frizz-free hair. It is found in all of the products from the shampoo and conditioner to the serums and other treatments available to you to enrich your hair’s texture by improving its Juvexin keratin load! Visit Global Keratin for more information! HaiR by SHeNaNiGaN’S is owned and operated by Trent and Pat Bowman! We have been in business together as a team since 1992 and have over 46 years experience to please you! We are devoted to creating the Cutest You each time you visit! We believe that our customers needs are of the utmost importance. We are committed to meeting those needs. As a result, a high percentage of our business is from repeat customers and referrals. We use only the best products such as Global Keratin Hair Treatment, Minx Nails, Shellac Nails, Enzyme developers for BES Color, Redken and Matrix Colors and Hair Laser Treatments! We love listening to your hair and natural nails needs and helping you achieve them. Our clients are the best and we would love to include you as one as well! Please check out our services and call us to schedule your next appointment today! Minx is the Hottest nail covering around! Minx is an ultra-thin polymer coating applied by heat in shiny metallics, cheetah prints, polka dots and more. Any women who wants to be at the height of fashion or wants something special for an event will have to make an appointment with us today! Once you’ve been Minxed you’ll never go back!! Callie picked out “Lisa Logans Desert Rainbow” and she was so crazy about them!!!! The yellow and purple colors were just right for her. Callie can’t wait for school to start so she can show off her next Minx….So Girls take a look at Minxnails.com you want believe all the new designs!! Have Fun and Hope to see you soon!! !